My first post here. I have an opportunity to purchase a Jet Model JJ-6CSX jointer/planer for $450. It is ten years old, but looks like it’s more like three years old. The guy selling it has stepped up to a larger jointer, and that’s why he is selling this one. I’ve never used any Jet tools. Any ideas on whether this may be worth the trouble? It’s about a two-hour drive for me to go and get it. According to the reviews I have read, this model is great, and retails new for between $700 and $800. I just don’t have a lot of money to throw around, but I need a jointer, hopefully a good one. While Jet tools can be very good, and a new 6” Jet jointer can run in the $700 range, that doesn’t make them the best bang for the buck going. Jet is an Asian import, much like Grizzly, Shop Fox, GI, Steel City, Ridgid, Delta, and others. If purchased new, the owner enjoys dealer support and a warranty, which do not apply to used machines. That’s a good jointer, but there’s nothing about it that makes it worth that much of a premium. $450 for an average good used imported 6” jointer is too much IMHO. For $250 you can get something comparable used. For $450, you can get something comparable new with warranty. I agree with knotscott. I actually bought this same exact jointer used from Craigslist a few weeks ago. I payed 300 for it with the mobile base and an extra set of knives. I’d offer 250-300 for it if you want it and not much more. 450 is wayyy too much especially due to that fact you have to drive 2 hours to get it. ^agree with both above. I like JET tools but for $450, you should be looking at a better brand. I think $300 is probably the highest I’d do & that’s if it’s pretty impeccable. Check on the cost of knives ahead of time. Some jointers are kind of finicky. Good luck! I concur. I’ve got the 6” CSDX; it’s a nice jointer, but I would not pay $450 for a used one. Offer $250. I’ll pile on here also. I too have that Jet jointer and although I’m very pleased with it, that asking price is probably more than what the guy paid for it when he bought it. I don’t recall exactly when I bought mine but it wasn’t as long as 10 years ago and I paid just a little under $450 for mine. I guess there is near unanimity. I own the same machine and I have had no trouble with mine, but that is too much money. I think the seller is trying to recoup some of what he paid for his upgrade. Thanks, folks. That’s the kind of useful input I wanted to get. Of course, I do have to consider the fact that I live way out in the sticks, and shipping of any decent jointer is going to be probably $100-plus. But the warranty is a biggie. ^Tony, if the warranty is a huge issue, then you’re kind of stuck. I think that if you hang on long enough and scour CL, you might find a really old jointer that’s built like a battleship for less than your budget. The way I look at it is, as long as the tables move, the motor works, and I can get knives for it, you can’t really go wrong with an oldie. For the bucks on new, I think you could pick up a Grizz for pretty cheap. I’m not a Grizzly guy but there are probably thousands here with a Grizzly jointer. At least hundreds with the 6” Rigid at around $400’ish new. Good luck! @Bertha, what I meant was that (for the money being asked) warranty would be a big issue. I just sold a vintage Craftsman 10” tablesaw with cast iron pedestal, cast iron top, etc., that was about 40 years old, for $125. It was solid as a rock, but obviously had no warranty. It’s always one of the tradeoffs with buying/selling used equipment: warranty versus price. 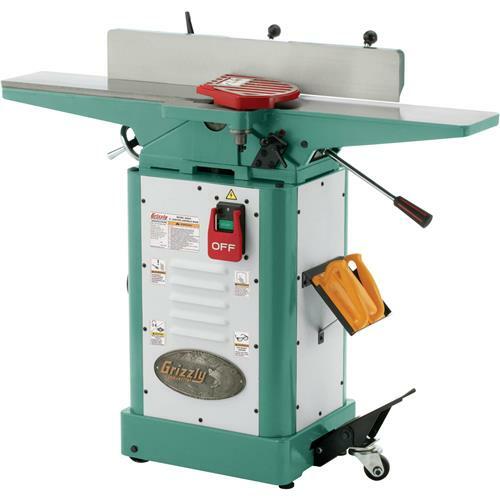 i have the same jointer bought it new…should b the gold series, came wid 2 extra sets of knifes..i,ll pile on to 300.max if he wont take that move on. Wolf – A new Grizzly G0654 is $425 plus $79 s/h (fixed rate), so $504 to your door with a 1 year warranty and built in wheels….$54 dollars more than the used Jet. Tony – If you review the specifications, the Grizzly that knotscott has referenced is very similar to the used Jet you are considering. The only difference of any significance, that I can see, is the built in mobile base (which works very well). Thanks, guys! I’ve decided against the original jointer, as the seller won’t come down from his $450 asking price. So, it’s time to move on! I appreciate all the input and recommendations! I also posted about a used Craftsman that I found: http://lumberjocks.com/topics/34364#reply-378914 Any opinions there? I know this is an old thread, but I have an opportunity to purchase what appears to be the same model for $350. The odd thing, is that when you plug in “Jet JJ-6CSX” into Amazon, you get a $1500 item! I’m confused, is there a sub-model number for these things to distinguish between the el-cheapo and the el-expensive versions? What is the difference between the two?